448 pages | 172 B/W Illus. Providing the guidance needed for formulation, handling, and quality control of photolabile drugs, Photostability of Drugs and Drug Formulations, Second Edition explores the significance of new information on drug photoreactivity in a pharmaceutical context. 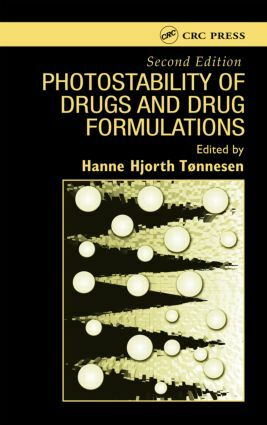 Completely revised and updated, with chapter authors drawn from an international panel of experts, the book supplies the background necessary for planning standardized photochemical stability studies as a part of drug development and formulation work. It contains comprehensive coverage of the physical and chemical aspects of drug photoreactivity, formulation, stability testing, and drug design/discovery in one resource. The contents have been reorganized to focus on the standardization of photostability testing of drug substances and products, in vitro photoreactivity screening of drugs, and various aspects of the formulation of photoreactive substances. The information on in vitro screening of drug photoreactivity is of great relevance for scientists who are developing and validating a set of testing protocols to address photosafety. Discussing kinetic and chemical aspects of drug photodecomposition as well as the practical problems frequently encountered in photochemical stability testing, this book helps you design a test protocol and interpret the results.